Where Oceania Docks in Bangkok & Saigon? Can anyone tell me where Oceania docks in Bangkok & Saigon? There seem to be docks close to the city center and ones further away. I am assuming since it is a smaller ship it is the dock closer in but I hate to "assume". We will be on the Insignia from Singapore to Hong Kong starting Oct10th. We were on Nautica. In Saigon it made it all the way up the river to the old cruise ship terminal at 10.767364,106.707782 which is about a mile from the centre of the city. In Bangkok, we docked at Klong Toey which is about 6 miles from the Royal Palace ( about an hour by bus ). Heck of a lot closer than Laem Chabang where the larger ships have to dock.. The photo is Nautica and Seybourn Pride from the Majestic hotel. I second what Rosebery said. Thanks so much! Really helps with the planning! We will be aboard the same cruise and I wasn't sure if you were familiar with the roll call so I thought I would give you a link for it. There are probably about 15-20 people who have checked in for this cruise. I have been told that many use the roll call to meet others and book independent tours. We have met some people through the roll call, but we have planned mostly to use the Oceania tours. Just thought this information may be helpful! Yes I am familiar with Roll Call. We are coming from Miami and traveling with some friends from San Francisco. We will probably plan independent tours and maybe do some Oceania tours. My husband and I have been on Oceania Marina before and loved it. Our friends have never been on Oceania. This will be our first time on Oceania, but are traveling with seasoned Oceania cruisers. We are leaving out of SF as well, getting into Singapore a few days early. Very much looking forward to this trip! Do you mind me asking where you are staying in Singapore? We haven't decided yet and are considering several places. Would love some input. We are staying at the Pan Pacific. We are traveling with my in-laws and they have stayed there previously and highly recommended it, so we decided to stay there as well. We leave SF on 10/7 so we will two days in Singapore prior to embarkation. My name is Tien and I am a local people in Saigon. Your cruise will be parked in Phu My Port which is far away from Saigon about 70km. If you want to visit Saigon, You will need a shore excursion to get into HCMC ( Saigon) ( Around 35$-40$ per person). There is no shuttle bus here. Sorry cruisvn but you are not correct. Oceania's ships can come up the river, they are small. You have personally been on them there. Oh, got it . Good luck ! Sorry, I meant to say I have personally been on them, not you! Whoops. We were on the Nautica this past February and we lucked out with the closer to town dock. The cruise up the river was fascinating and it did make it easier for the private tour guide to pick us up. If you are arriving around Chinese New Year, it will be crowded, so beware. Thanks for the information. Is it confirmed to dock at Khlong Toei? My wife and I are also sailing on that cruise, flying out of Sydney to join in Singapore. We are hoping to a arrange private tour of Bangkok, so if it docks at the nearer port it will make life much easier! Does anyone have a more recent experience with the port location for Nautica in Bangkok and Saigon? I am specifically interested in the March 4th 2020 cruise. Thanks! Nautica was docked next to us in downtown Ho Chi Minh City last month (I was on the Silver Shadow). 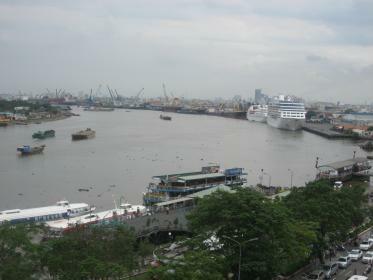 It is a fantastic place to dock, and sailing up the Saigon River to get to the heart of downtown is also quite a thrill. Ships that are larger than Nautica and Silver Shadow cannot dock downtown, as they are too large to turn around and sail back out. If you are hoping for quick and easy access to the city, you should have that on Nautica.